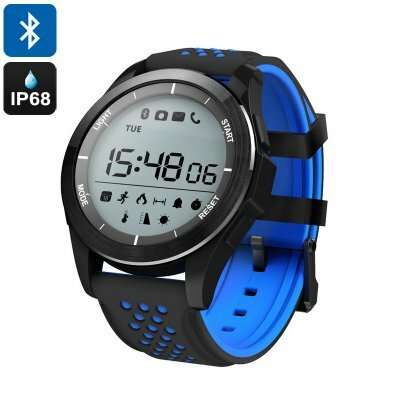 Successfully Added NO.1 F3 Sports Watch - Bluetooth 4.0, Pedometer, Sedentary Reminder, Sleep Monitor, 1.1 Inch Display, IP68 Waterproof (Blue) to your Shopping Cart. Take your connectivity to the next level with this affordable Bluetooth watch. The NO.1 F3 has Bluetooth 4.0 thanks to which it can be easily synchronized with your iOS or Android smartphone. Once connected, it lets you receive incoming message and call notifications straight onto your wrist. Additionally, it also lets you know when you have received an update on Social Media. Thanks to this, you can be guaranteed that you won’t miss out on an important message. Your Bluetooth watch holds a CR2032 button battery. This little cell provides enough juice to let it run for a year without you needing to worry about battery life. This sports watch furthermore comes packed with several high-end health and fitness features. A pedometer is in place to keep accurate track of the steps you take and distance you cover throughout the day. Thanks to this, you can be guaranteed that you’ll always hit your daily exercise levels. Your fitness tracker also comes with a sedentary reminder that will remind you to get enough exercise. From now on, you’ll never find an excuse again to skip your daily sporting sessions. With its sleep monitor, this Bluetooth sports watch make sure you get sufficient rest in between your work outs. This is important as it stimulates your recovery and muscle growth. With this fitness tracker at your side, you’ll be able to hit your fitness goals in the fastest and most efficient manner. The watch itself has a casual design which makes it suitable for any occasion. With its tough IP68 waterproof body, you won’t have to worry about it accidentally getting in contact with water. The NO.1 F3 Bluetooth watch comes with a 12 months warranty, brought to you by the leader in electronic devices as well as wholesale sports watches..